Driven by a highly competitive market, regulatory pressure, and a growing need for innovation, insurers are changing how they do business. To manage that change, leaders need to know what it costs to provide services to internal consumers — and whether the organization is aligned on service levels and performance. Using this key information, leaders can identify opportunities and take decisive actions to measurably impact performance. Like the Service Management framework itself, our approach to helping organizations create change is unique in the industry. We employ a top-down, iterative process that takes advantage of existing capabilities to unlock hidden value and capitalize on early successes — whether you’re focused on a single relationship within the organization, a department, or the entire enterprise. Service Management provides clarity in a wide range of situations. In addition, we’ve developed specific content that can serve as a starting point in defining your own unique service model. 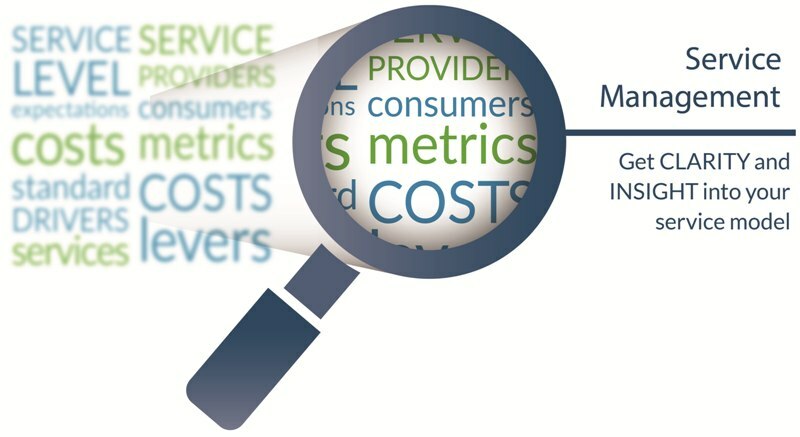 Whether you want more transparency into your shared service organization, better distribution of work across multiple service centers, or a clearer understanding of what’s driving costs in your product / service portfolio, you can choose components of the Service Management framework to quickly identify key issues and to drive solutions. Insurers that employ Service Management will not only have critical data to support strategic decisions, but also a common language that helps all stakeholders define and understand the criteria for those decisions.